Draft: 2004, Seattle Mariners, 11th rd. Michael Edward Brett Saunders … resides in Castle Rock, Colo., with his wife Jessica and children Aria, Declan and Sloane...Played in the 1999 Little League World Series...Also played hockey and lacrosse growing up. Appeared in 38 games in the Minor Leagues between Triple-A Norfolk in the Baltimore organization and Triple-A Charlotte in the Chicago-AL organization...Originally signed by Kansas City to a Minor League contract Feb. 23 but was released mid-way through Spring Training on March 24...Signed by Baltimore to a Minor League contract on April 2 and appeared in 25 games with Triple-A Norfolk, before being released on May 15 … batted .161 (14-for-87) with three doubles, one triple, one home run and 14 RBI...Signed by Chicago-AL to a Minor League contract on May 21 … appeared in 13 games with Triple-A Charlotte, batting .152 (7-for-46) with one double, one home run and four RBI. Appeared in just nine games after suffering a knee injury in the early days of spring training. Underwent surgery in late February to remove part of the meniscus in his left knee. Began the season rehabbing before his return to the Blue Jays on April 25. Was placed on the disabled list after his game on May 9 and did not return for the balance of the season. Appeared in 78 games, making 62 starts (RF-53, CF-9)...Recorded a .791 OPS, which was 2nd-best on the club behind Robinson Cano (min. 200 PA)...Despite collecting only 231 at-bats, set career bests in average (.273), on-base percentage (.341) and slugging (.450)...Hit .292 with, 10-2B, 2-3B, 7HR, 31RBI and an .830 OPS in his final 57 games (since May 1); began the season hitting .179 with 1-2B, 3B, HR and 3RBI in his first 21 games...Hit .276 with 9-2B, 2-3B, 8HR, 26RBI & .831 OPS against RHP; hit .262 against lefties...Had two stints on the disabled list: June 12-27 (right AC joint inflammation) and July 11-Sept. 8 (strained left oblique)...During two rehab assignment with AAA Tacoma hit .327 with 3-2B, 3B, HR and 9RBI in 15 games...While on his second rehab assignment, missed time with a viral infection after the birth of his daughter...Started May 5 vs. Oakland in center field, moved to left in the 8th, then to right field in the 9th...Became just the third Mariners player ever to play all three outfield spots in one game...Joined Rich Amaral (Sept. 11, 1992 vs. MIN) and Stan Javier (April 21, 2001 vs. LAA). Appeared in 132 games, making 109 starts in the outfield (CF-78 G/69 GS, RF-34 G/28 GS, LF-24 G/12 GS). One of 8 players in club history to start 10 or more games at each outfield position, first since Stan Javier in 2000. Led the team for second straight season with 13 stolen bases… also led team with 7 outfield assists. Recorded 5th career multi-HR game Aug. 3 at Baltimore (2x4, 2 HR, 5 RBI). Career-high 10-game hitting streak July 8-21 (.351/13x37, 10 R, 5 2B, 3B, HR, 11 RBI). Recorded career-high 3 extra-base hits May 4 at Toronto (3x5, 2 R, 2B, 2 HR, 3 RBI)…was his second multi-homer game at Rogers Centre, he also went deep twice April 27, 2012 (solo in 9th, grand slam in 10th). Hit first leadoff home run April 29 vs. Baltimore in first PA after returning from disabled list. On 15-day disabled list April 11-29 with a sprained AC joint in his right shoulder (collided with the right field fence 4/10 vs. Houston). Appeared in 139 games, making133 starts (CF-107, LF-22, RF-4)...hit .247 (125x507) with 71runs, 31 doubles, 3 triples, 19home runs, 57 RBI, .738 OPS ... Set career-highs in games (139),at-bats (507), runs (71), hits (125),doubles (31), triples (3), homeruns (19), walks (43), steals (21) ... Hit 19 homers and led the teamwith 21 stolen bases...fell oneHR short of becoming Mariners first 20 HR-20 SB player since Mike Cameron in 2002 ... One of 5 AL players with at least 19 HR and 19 SB: Mike Trout (30 HR, 49 SB), B.J. Upton(28 HR, 31 SB), Alex Rios (25 HR, 23 SB), Ian Kinsler (19 HR, 21 SB)...ranked T5th in theAL in the Bill James Power-Speed statistic at 20.0 (2 x HRxSB/HR+SB) ... Hit .261 (47x180) with 11 doubles, 1 triple, 8 home runs, 18 RBI vs. LHP, the 11th highestby lefty vs. lefty in the AL ... Hit 9 home runs over his last 28 games, batting .272 (28x103) with 15 extra base hits, 22RBI, .359 OBP, .612 SLG, .971 OPS ... Hit 4 home runs over 4 game stretch Aug. 19-22, including third career multi-homer gameAug. 20 vs. Cleveland (3x4, 2 R, 4 RBI) ... Missed six games Aug. 25-30 after collision that ended game Aug. 24 at CWS (collidedwith Eric Thames) ... Recorded 8 games of 3+ hits, all since May 29 including a career-high 4 hits June 2 atChicago (AL)...back-to-back 3-hit games May 29-30 at Texas ... Hit a solo HR in the 9th inning, and a grand slam in the 10th April 27 at Toronto to help liftthe Mariners to a 9-5 comeback win in 10 innings over the Blue Jays...was only the thirdtime in club history that a player has hit two home runs in the 9th inning or later: DonnieScott on April 29, 1985 vs. MIL (solo in ninth, 2-run in 10th) & Jim Presley on April 8, 1986on Opening Day against Angels (2-run in 9th, walk-off grand slam in 10th) ... Became the fourth Canadian-born player to hit 2 home runs in a game while playing inCanada April 27 at Toronto, joining Larry Walker (4/5/97 vs. MON, 6/28/92 vs. PIT, 8/4/94vs. STL at Olympic Stadium & 6/14/05 vs. TOR at Rogers Centre), Matt Stairs (8/13/99 vs.TOR at Rogers Centre) & Justin Morneau (7/23/07 & 5/17/10 vs. TOR at Rogers Centre). Made Opening Day 25-man roster for the first time in his career...two stints with Seattle, April 1-June 2 and Sept. 6-end of season...Appeared in 58 games, making47 starts in the outfield (CF - 46 G/42 GS, LF - 12 G/5 GS)...started 20 consecutive team games in center field (April 23-May 17)...Recorded an RBI in each of his first 5 games of the season (April 2-10), tying the Mariners record with John Olerud (2001)...Spent majority of season with AAA Tacoma...named Rainiers Gold Glove award for best defensive player after putting together a .978 fielding percentage over 64 games in the outfield...Placed on minor league temporary inactive list on June 17, reinstated July 3...Tied career-high with 5 hits July 30 vs. Las Vegas, going 5-for-5 with 2 runs scored, 2 home runs and season-high 4 RBI (also: 6/6/07 vs. Inland Empire)...Reached base safely via hit or walk in 58 of 64 games...walked 50 times, the most since walking 67 times combined between High Desert and West Tenn in 2007. Appeared in 100 games including85 starts (LF - 74, CF - 11)....Among American League rookiesranked 3rd in home runs (10), 7thin RBI (33) & walks (35)....Recorded first career multi-HRgame June 30 at Yankee Stadium(2x4, 2 HR, 3 RBI)...became12th rookie in club history tohave multi-homer game...firstMariners rookie to record a multihomerun game at Yankee Stadium since Ken Griffey Jr. (5/30/89)....Led team with 8 outfield assists despite playing in just 89 defensive games...assist totalis T6th most in team history....Hit first Major League home run on May 9 (Mothers Day) vs. LAA (off Ervin Santana)....Hit 3 go-ahead home runs (June 7 at TEX; July 24 vs. BOS; Sept. 22 at TOR)...Had a career-high 8-game hitting streak July 11-27 batting .400 (10x25)....Had career-high 4 RBI June 23 vs. Chicago (NL), going 2x3, 2 runs, 1 home run....Drew a walk in a season-high 5 consecutive games July 3-7....Recalled to Seattle on May 6 (M. Bradley placed on restricted list)....Opened the season with AAA Tacoma, hitting .200 (16x80) with 5 RBI in 21 games. Selected from Tacoma (AAA) onJuly 25...made Major Leaguedebut that night vs. Cleveland(0x4 in start in LF)...Appeared in 46 games, includingmaking 34 starts in left field...Recorded first Major League hiton July 26 vs. Cleveland (singleoff Cliff Lee)...added RBI singleto LF in 9th...6 of his 27 hits were buntsingles...is 4th Mariner rookie with at least 6 bunt hits in a season (Ichiro-10, 2001; S.Monahan-7, 1998; J. Reed-6, 2005)...Recorded first career extra-base hit Aug. 5 at KC (3B)... Had season-high 3-game hit streak Sept. 17-23 (5x5) and Aug. 4-6 (6x13/.462)...Broke an 0-for-24 streak with a single in the 13th inning on Sept. 17 vs. CWS...Recorded hits in 5 consecutive at-bats, Sept. 17-23...singled on Sept. 17 vs. CWS and19 vs. NYY and went 3x3 with a triple, 2 runs scored and a stolen base on Sept. 23 at TB...Opened the season on the minor league DL recovering from shoulder surgery (rightshoulder); reinstated and assigned to the Tacoma roster on April 30...Started 64 games for Tacoma (LF-39, CF-24, RF-1)...Hit 5 of his 13 home runs during a 7 game stretch, April 30-May 7...also recorded three3-RBI games over 4 games, April 30-May 4...Scored a run in 22 consecutive games (29 runs total), May 6-31...Recorded season-high 15-game hit streak, batting .400 (26x65) with 21 runs scored, 3doubles, 1 home run and 5 RBI, May 14-31...On the 7-day disabled list with a strained right hamstring, June 30-July 9...Hit .340 (17x50) in 13 games in July, including batting .394 (13x33) with 7 runs scored, 4doubles, 2 home run and 3 RBI during 8-game hit streak, July 17-24...Rated by Baseball America as the Mariners No. 2 prospect heading into the 2010season...also rated as being the best defensive outfielder in the Mariners organization. Began season with West Tennessee...recorded 8-game hit streak (.424/14x33),April 12-19 and a season-high 9-game hit streak (.390/16x41), May 2-11...promoted toTacoma (AAA) on June 19...competed for Team Canada in the Beijing Summer Olympics,July 28-Aug. 25...hit .286 (8x25) with 5 runs, 2 doubles, 2 home runs and 4 RBi in 7games...returned to Tacoma and placed on the disabled list on Aug. 27 after havingsurgery on his right shoulder. Split season between High Desert (A) and West Tennessee (AA), finishing T3rd amongall Mariners Minor Leaguers in RBI (84), T4th in stolen bases (29) and 7th in average(.298)...had 38 multi-hit games with High Desert, including 6 three-hit games, 1 four-hitgame and 1 five-hit game...recorded season-high 14-game hit streak, hitting .400 (24x60) with 17 runs scored, 9 extra-base hits and 20 RBI, May 6-22...recorded 2 multi-home rungames, May 22 vs. Lake Elsinore and June 10 at Stockton...recorded 25 RBI in 28 gamesin May...named Southern League Player of the Week twice, May 7-13 and June 4-10...promoted to West Tennessee on Aug. 9, hitting safely in 10 of 15 games...placed on theDL with a skull contusion, Aug. 27...member of the World Team in the 2007 MLB FuturesGame...represented Canada in the 2007 International Baseball Federation (IBAF) WorldCup in Taiwan, Nov. 6-18. Spent season with Wisconsin in the Midwest League...led the team with 22 stolenbases, 8 triples and 48 walks...hit .400 (10x25) during 6-game streak, July 21-27...played with Canada in the Olympic Qualifier games...participated in the Mariners ArizonaInstructional League. Joined Mariners organization as a draft-and-follow...began pro career with Everett...hit .270 (53x196) with 7 home runs and 39 RBI in 56 games...batted .325 (27x83) with 17RBI in 24 games in August...participated in 2005 Arizona Instructional League. March 18, 2019 Albuquerque Isotopes released OF Michael Saunders. March 18, 2019 Colorado Rockies released OF Michael Saunders. February 6, 2019 OF Michael Saunders assigned to Albuquerque Isotopes. 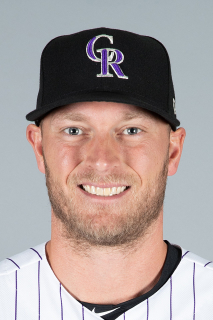 January 1, 2019 Colorado Rockies signed free agent OF Michael Saunders to a minor league contract and invited him to spring training. June 21, 2018 Charlotte Knights released OF Michael Saunders. May 21, 2018 Chicago White Sox signed free agent OF Michael Saunders to a minor league contract. May 21, 2018 OF Michael Saunders assigned to Charlotte Knights. May 15, 2018 Norfolk Tides released DH Michael Saunders. April 2, 2018 Baltimore Orioles signed free agent OF Michael Saunders to a minor league contract. April 2, 2018 DH Michael Saunders assigned to Norfolk Tides. March 24, 2018 Kansas City Royals released RF Michael Saunders. March 1, 2018 Kansas City Royals invited non-roster RF Michael Saunders to spring training. February 23, 2018 Pittsburgh Pirates released RF Michael Saunders. February 21, 2018 Pittsburgh Pirates signed free agent RF Michael Saunders to a minor league contract and invited him to spring training. February 21, 2018 RF Michael Saunders assigned to Indianapolis Indians. November 2, 2017 LF Michael Saunders elected free agency. August 8, 2017 Buffalo Bisons activated LF Michael Saunders from the 7-day disabled list. August 2, 2017 Buffalo Bisons placed RF Michael Saunders on the 7-day disabled list retroactive to July 31, 2017. June 28, 2017 Toronto Blue Jays signed free agent RF Michael Saunders to a minor league contract. June 28, 2017 RF Michael Saunders assigned to Buffalo Bisons. June 23, 2017 Philadelphia Phillies released RF Michael Saunders. June 20, 2017 Philadelphia Phillies designated RF Michael Saunders for assignment. January 19, 2017 Philadelphia Phillies signed free agent RF Michael Saunders. November 3, 2016 LF Michael Saunders elected free agency. November 2, 2015 Toronto Blue Jays activated LF Michael Saunders from the 60-day disabled list. April 25, 2015 Toronto Blue Jays activated RF Michael Saunders from the 15-day disabled list. April 9, 2015 Toronto Blue Jays sent OF Michael Saunders on a rehab assignment to Dunedin Blue Jays. April 5, 2015 Toronto Blue Jays placed RF Michael Saunders on the 15-day disabled list retroactive to March 27, 2015. Left knee meniscus tear. September 8, 2014 Seattle Mariners activated RF Michael Saunders from the 15-day disabled list. August 7, 2014 Seattle Mariners sent OF Michael Saunders on a rehab assignment to Tacoma Rainiers. June 27, 2014 Seattle Mariners activated RF Michael Saunders from the 15-day disabled list. June 20, 2014 Seattle Mariners sent RF Michael Saunders on a rehab assignment to Tacoma Rainiers. June 12, 2014 Seattle Mariners placed RF Michael Saunders on the 15-day disabled list retroactive to June 11, 2014. Right AC joint inflammation. April 29, 2013 Seattle Mariners activated RF Michael Saunders from the 15-day disabled list. April 26, 2013 Seattle Mariners sent RF Michael Saunders on a rehab assignment to Tacoma Rainiers. September 6, 2011 Seattle Mariners recalled Michael Saunders from Tacoma Rainiers. August 12, 2011 Michael Saunders roster status changed by Tacoma Rainiers. August 3, 2011 Tacoma Rainiers placed CF Michael Saunders on the temporarily inactive list. July 2, 2011 Tacoma Rainiers activated CF Michael Saunders from the temporarily inactive list. June 17, 2011 Tacoma Rainiers placed CF Michael Saunders on the temporarily inactive list. June 3, 2011 Seattle Mariners optioned CF Michael Saunders to Tacoma Rainiers. November 15, 2010 OF Michael Saunders assigned to Cardenales de Lara. May 6, 2010 Seattle Mariners recalled Michael Saunders from Tacoma Rainiers. May 6, 2010 Seattle Mariners activated CF Michael Saunders. March 18, 2010 Seattle Mariners optioned Michael Saunders to Tacoma Rainiers. October 9, 2009 OF Michael Saunders assigned to Cardenales de Lara. July 25, 2009 Seattle Mariners selected the contract of Michael Saunders from Tacoma Rainiers. July 9, 2009 Michael Saunders roster status changed by Tacoma Rainiers. July 2, 2009 Tacoma Rainiers placed LF Michael Saunders on the 7-day disabled list retroactive to June 30, 2009. April 30, 2009 Tacoma Rainiers activated LF Michael Saunders from the 7-day disabled list. April 7, 2009 Tacoma Rainiers placed CF Michael Saunders on the 7-day disabled list.